All of our eBay listings have compatibility features. You can view which vehicles the part fits under the 'Compatibility' heading in the eBay listing (See fig. 01). From here you will be able to see a list of all vehicles the part currently fits as well as important information regarding your own car's specifications. Be sure to click the 'View' button under the 'Notes' column in the Compatibility (See fig. 02), as important info such as 2WD/4WD, Turbo/non-Turbo, 310mm caliper, 1.8L/2.2L, etc. will be noted here. It is important that you take the time to research all specifications of your car to ensure the accuracy that the part fits. Leaving out this information can cause problems and the wrong rotors ordered on the buyers part. In this case, please contact us before buying if you are unsure about the part's compatibility. There are rarely on occasions a listing that may only have generic info for the compatibility (See column below). 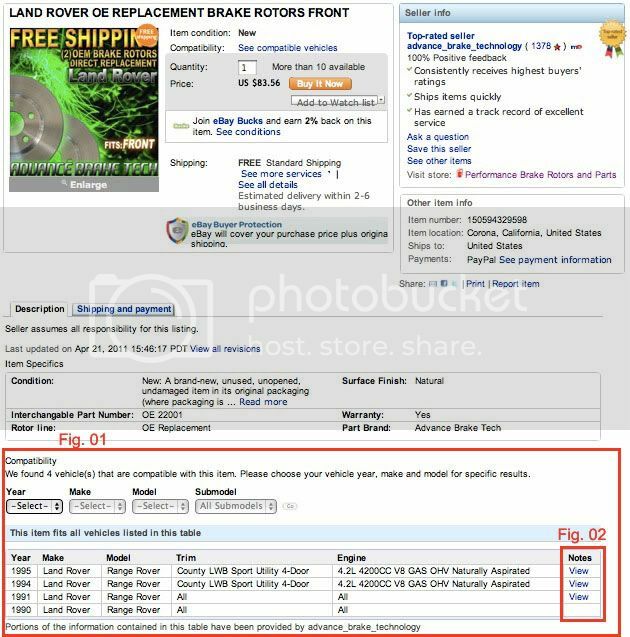 Although the part may in fact fit that particular vehicle despite other listed cars that have more information in that listing, it is recommended that you contact us to check and confirm it is the right part for you.